With the 2020 primary elections just within sight and congressional Democrats preparing to take the House majority in January, some Democratic lawmakers, such as Rep. Pramila Jayapal (D-Wash.), are seizing the opportunity to act on a long-time goal of progressives: a federally run health care system for all Americans. 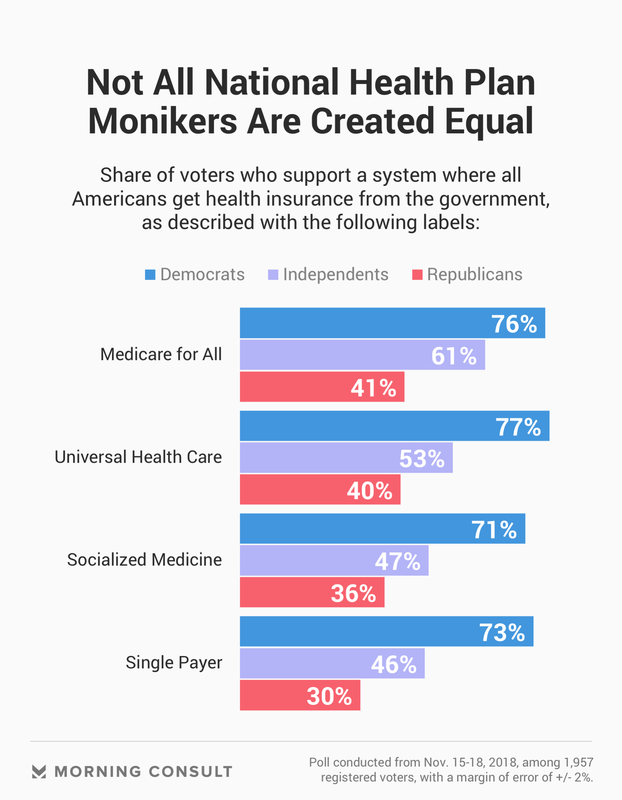 As they deliberate messaging tactics, a new Morning Consult/Politico survey suggests that while describing the controversial health policy as “Medicare for all” is a crowd pleaser, Democrats should avoid calling it a “single-payer” plan. The survey of 1,957 registered voters asked respondents about their support for a system where all Americans would get their health insurance from the government, labeled as Medicare for all, single payer, universal health care or socialized medicine. While not truly synonymous, the terms are often used interchangeably to describe a national health plan that guarantees coverage for each resident. According to the messaging test in the survey, “Medicare for all” has the highest favorability, with 58 percent of registered voters saying they would back such a plan. By contrast, “single payer” has the lowest odds of captivating voters, with 49 percent saying they support a health care system under that title. 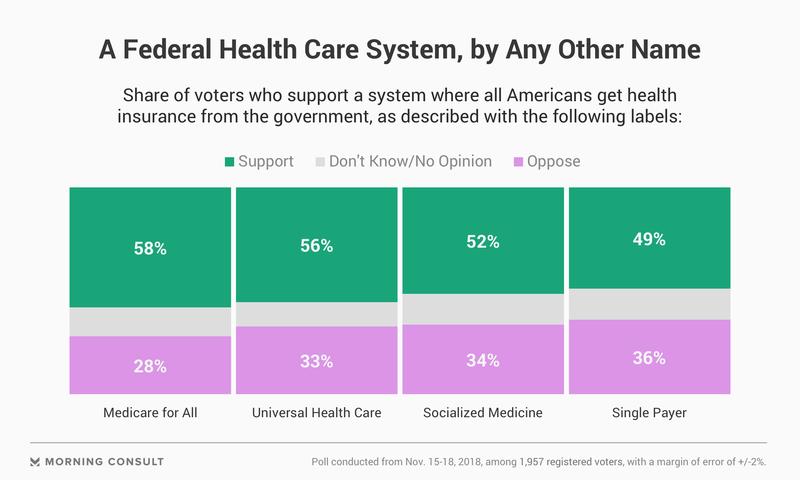 “Universal health care” and “socialized medicine” are supported by 56 percent and 52 percent of respondents, respectively. The Nov. 15-18 poll has a margin of error of 2 percentage points. While the term “single payer” has been in the health policy vernacular for decades, Sen. Bernie Sanders (I-Vt.) popularized the term “Medicare for all” during his presidential campaign two years ago. Since then, Republican lawmakers have zeroed in on the proposal and argued it would have debilitating effects on the economy and current Medicare beneficiaries. But policy experts say the familiarity of Medicare, a widely popular program, has made “Medicare for all” more amenable to the public. Bianca DiJulio, associate director for public opinion at the Kaiser Family Foundation, said that Democrats are partial to using this language because “Medicare” is something people know and understand. By contrast, “single payer is more vague and can sound more nebulous,” she said. While the overwhelming majority of Democratic voters support a government-run health care system irrespective of title, Democrats hoping to win over moderate Republicans and swing voters would do well to avoid the phrase “single payer,” according to the survey results. Among GOP voters, support for a government-run health care system rose by 11 points, to 41 percent, when it was called “Medicare for all” instead of single payer, which garnered 30 percent of this group’s support. (Still, most Republicans did not back such a system, no matter what it was called.) Affinity for “Medicare for all” was even stronger among independents, whose support jumped 15 points, to 61 percent. The moniker “single payer” is so unappealing, in fact, that GOP voters in the survey prefer “socialized medicine” (36 percent), a term historically used by conservative lawmakers and media to disparage a national health plan. That is a shift from a November 2017 Kaiser Family Foundation poll that found a larger share of Republicans reacted favorably to the term “single payer” than to “socialized medicine,” 37 percent to 14 percent. That’s not to say Democratic lawmakers hoping to draw skeptical voters should lean into “socialized medicine” or “single payer.” Among voters as a whole, 34 percent in the Morning Consult/Politico poll said they oppose socialized medicine and 36 percent oppose single payer. Support for “Medicare for all” among the electorate — and among Republican voters — has not budged since Morning Consult polled on the issue in October, just ahead of the midterm elections, suggesting GOP lawmakers’ argument that “Medicare for all” would destabilize the existing entitlement program did not sway voters either way. Jayapal, co-chair of the Medicare for All Caucus, is working with other caucus members on revising “Medicare for all” legislation, H.R. 676, so that it can be introduced during the 116th Congress, according to a Nov. 13 report from The Hill. A spokesman for Jayapal said Monday that her office was not aware of any vote on such legislation coming to the House floor at this time.